To purchase tickets online, click on the link at the bottom of this page. Broadway's greatest farce is light, fast-paced, witty, irreverent and one of the funniest musicals ever written. 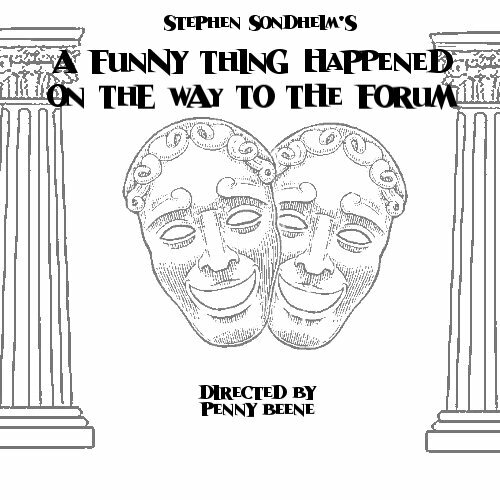 A Funny Thing Happened on the Way to the Forum takes comedy back to its roots, combining situations from time-tested, 2000-year-old comedies of Roman playwright, Plautus, with the infectious energy of classic vaudeville. A Funny Thing Happened on the Way to the Forum is a nonstop laugh-fest in which Pseudolus, a crafty slave, struggles to win the hand of a beautiful, but slow-witted, courtesan named Philia for his young master, Hero, in exchange for freedom. The plot twists and turns with cases of mistaken identity, slamming doors and a showgirl or two.This unforgettable, hysterical musical allows a terrific ensemble of comedic actors to shine – "something for everyone, a comedy tonight!"